In the post titled "The Meeting" I showed you my cover for Issue #2 of the Australian comic magazine called Inkspots. Two further issues of Inkspots were produced and I contributed a story to each, along with Steph Campbell, Chris Johnston, Phillip Kanlidis and Darrel Merritt. I was eighteen years old and had been working on a Zooniverse comic under the encouragement of Publisher Colin Paraskevas (this Zooniverse prototype was done in the style that I had to shed when another artist "borrowed" it later on). To my disappointment, Colin didn't want to use this work in the next Issue of Inkspots. Instead he and fellow publishers Philip Bentley and Greg Gates wanted me to do a more serious, "realistic" piece. They insisted that I do something in a "Moebius style". I was reluctant. Why would I want to imitate Moebius when I had so many styles of my own that I wanted to explore. To my way of thinking, if it's been done (and done well in Moebius' case), why repeat it? Which is why I've never been interested in doing any work based on reality. Just go for a walk and you'll see plenty of realism. I've always preferred to exaggerate my characters and invent entirely new concepts, I want to show things that have never been seen before. A journalist of the non-existent. Eventually I figured that I could use this opportunity to prove a point and move on. I would be able to demonstrate that I could draw a competent looking humans from memory at the age of eighteen and never need to do a "realistic" comic again. So I worked diligently and completed the task, but before I could hand in my comic, the publishers had one more obstacle for me.... go back and Letratone the entire eleven pages!!! For those unfamiliar with this sticky evil of the pre-computer age, Letratone was a page of dots in various shades of gray, printed onto adhesive plastic film that we had to stick onto our artwork, we then cut away the excess tone with a scalpel. It was exceedingly time consuming! No bucket filling back then! 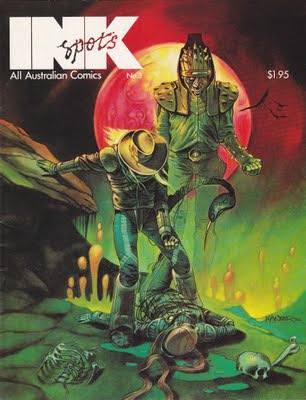 I had finished the inked version in 1981 while still eighteen, but it took me twice as long to wrangle the Letratone, struggling with it until publication in 1983. I had always hoped to color Scarpion so I knew to my dismay that I was ruining my originals forever. The story I did centers around a pacifistic race, called the Scarpion, who were hunted to near extinction for their glands capable of aiding organ regeneration in humans, there is one survivor. This solitary Scarpion has been kept safe in a hidden dimension blanketed by a sea of living, conscious, growths. A lone silicon girl races to protect the Scarpion from a hostile half-robotic intruder, who is intent on harvesting the Scarpion to restore his own damaged body. It is a tale full of irony and personal symbolism. Shown here is a detail of page 4, in color for the first time. Please click to enlarge. 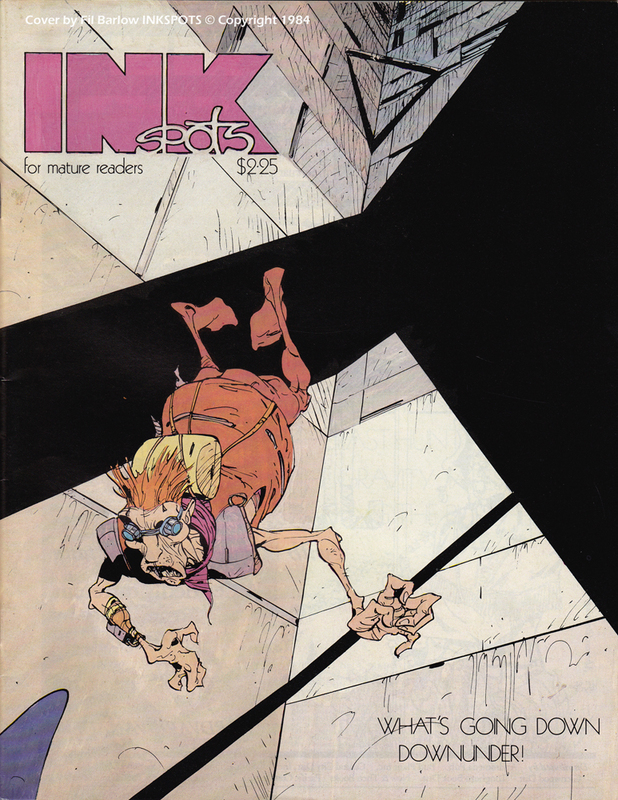 Issue #4 of Inkspots saw the artists take over the production. A meeting was held and publisher Colin Paraskevas called for us to abandon our large black and white format for the smaller, thinner, full colored American comic format. He also suggested releasing the magazine through the US distribution channels. At the time we were aiming for the French Bande Dessinée (comic) market, even though we had no solid connections established, so we unanimously voted against Colin's offer and he, unfortunately, took his leave from Inkspots, accurately predicting that our direction was folly. Artist Steph Campbell took over as Editor for this issue. I did the cover based on the ten page comic I created called Asphyxiation. Asphyxiation was a bleak story set on a colonized planet where, thanks to a chemically waged civil war, oxygen had become a scarce commodity. Without some kind of filter mask and air pump, the people couldn't breathe. 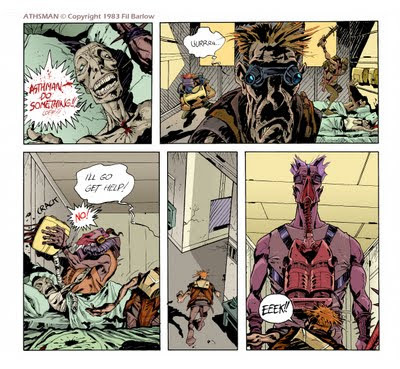 A lone character called Asthman had been newly fitted with an experimental device on his arm that used oxytablets to release oxygen directly into his bloodstream. Asthman had no need for a mask. While visiting a friend in hospital, desert raiders begin ransacking for respirators. Here are five panels that I've colored for the first time. Please click to enlarge. There was an ill-fated Issue #5 of Inkpots prepared. One publisher remained, Greg Gates. This was to be the issue that would finally launch Zooniverse and I prepared the wrap-around cover and 10 pages for that issue, none of this work has ever been published. Now an odd thing happened, somehow it had been decided that this issue would be titled "Inkspots featuring Zooniverse" and the next issue would be titled "Zooniverse featuring Inkspots," eventually phasing out Inkspots all together. I just went along with all of these decisions a bit dazed by the strangeness of everyone being willing to drop the established Inkspots title, but excited by the chance to finally get started on my signature project. "I heard that you are going to keep doing Zooniverse." I replied confidently, "I am!" Colin continued,"Do you want to do it my way? We'll publish it in the USA, in color, you'll have to reformat your art to fit. Are you still interested?" Without hesitation I responded, "Let's do it!" And that's how Zooniverse was born, out of the ashes of Inkspots, I offered back up stories to the Inkspots artists to showcase their talents to the world. Chris Johston, Steph Campbell, Frantz Kantor and Darrel Merritt answered the call. I decided to start fresh and never used artwork I did for Inkspots which was intended to be a ten page installment. The story for the first ten pages in Issue #1 of Zooniverse is roughly the same but with some added pages and panels, but my style had improved because of the practice run I'd had with the doomed last issue of Inkspots so I dropped that art and started fresh, tracing and improving panels as I worked in the new format. It's so cool to see these pages in color. @royalboiler Yeah, finally, eh?!! I wanted to see them in color back then. So this has been inspirational for me to see how this old stuff holds up. hoo boy! wotta treat to find this blog. I remember loving that INK SPOTS 4 cover of yours. @Jamie Baker Wow, I'm glad that you got to see it! Where can I get more Skarpion? I own issues 3&4 of Ink Spots. I love your work! @Anonymous I've been trying to find out if any of my old contacts have any back issues left. One day I hope to color these old comics working from the original art and re-release them. What I am showing here has been colored from old printed editions that were lent to me. Interesting blog to my mind. Thanks a lot for sharing this information. I absolutely LOVED InkSpots. I came across them when doing work experience with John Petropoulos (half of the creative team of Bug & Stump and co-publisher of AAARGH Comics!) and he said that I could have them. That was in 1996 (over a decade after they were published). The content was so fresh and off-the-wall and my belief is: like all good things, it was simply ahead of its time. I still have those issues in as good condition now as when I received them. This blog answered so many questions I had about why there were no more editions. Skarpion is still one of my favourite comic stories of all-time (without exaggeration). Thanks for making it! I finally have ALL of the original Skarpion art work back in my possession! Just saving up for an A3 scanner so that I can start digitizing all of my old comic work.